cheap generic viagra mail order pharmacy Michael Rumsey graduated from the school of hard knocks to become one of the most sought-after artists of his genre. 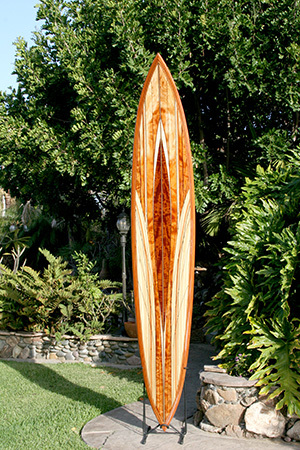 The talent extraordinaire builds one-of-a kind, hollow, wooden — and rideable — artistic surfboards. http://sanfordbiggers.com/bio order now Lumber remnants become an inlaid artistry of waves, palm leaves, fish, sunsets, moonlight, turtle flippers, fish lips and free-flowing designs. Boards are embellished with copper, turquoise, stone, mother-of-pearl, and abalone shell. Finishes include fiberglass, epoxy and clear varnish. order now Boards are void of paint or stain to showcase the wood’s natural timber. Rumsey’s wood pile includes pieces of koa, teak, mango, poplar, redwood, paulownia, walnut, padauk, wenge, mahogany and jatoba. Boards are built from sketches, although Rumsey admits that the completed project “resembles little if anything of the original sketch. 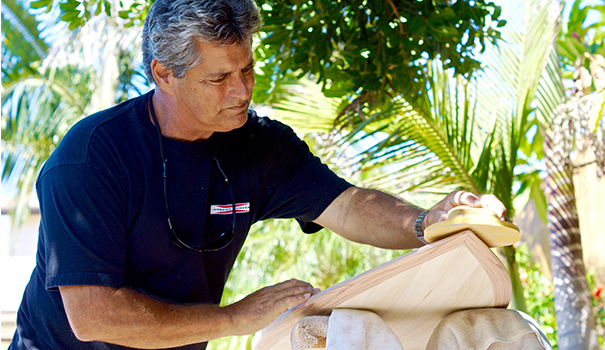 Using his grandfather’s tool kit to strip wood, Rumsey also creates mixed media murals, water features, outdoor living spaces, and hand-carved wood tikis. But life for this former daredevil has had its twists and turns. The ocean called Rumsey by age 12. At age 16, he began working in a lumber yard, an education that would carry him through the rest of his life. Encouraged by his grandma to pursue his artistic passion, he majored in art in college. Dropping out early to support a family did nothing to deter his artistic talent or passion. However, Rumsey’s career in the lumber industry was severed by a barefoot water-skiing accident at age 35. Among the many broken bones too long to list, Rumsey suffered permanent brain damage, double vision, and the onset of seizures. The road to recovery — which continues to this day — was arduous. Nothing was ever the same again. Determined to get better, he reignited his artistic career as therapy and rehabilitation. Working with copper — wrapping fishing poles — enhanced his motor skills and working with wood did the same for his hand-eye coordination. Rumsey refuses to be labeled by the accident. Learning and moving on supersedes a “disabled moniker that says I can’t do something. Describing his accident as a wake-up call, Rumsey encourages everyone to find their joy. Artistic wooden surfboards were an accident by friendship. The life-long surfer decided to entice his friend Sammy, who was suffering from ALS (Lou Gehrig’s Disease), into the water by building him a wooden surfboard. Sadly, Sammy succumbed to the disease before the board was completed. To this day, Rumsey glues a penny as “an ode to Sammy” on every board. Rumsey inherited cans of his friend’s collected pennies. Boards can take up to three months to complete. Prices are determined by the finish, the complexity and intricacy of design as well as the type of wood. Rumsey will be among 350 local, regional and international artists showcasing an extraordinary collection of paintings, sculptures, photography, jewelry, metal and wood work at the Mission Federal ArtWalk, San Diego’s largest fine art festival, now in its 35th year. Touting its theme, “Connecting Creative Communities,” the annual event will also have dance, music and spoken word performances as well as family-friendly interactive art projects on the ever-so-popular KidsWalk. Visitors perusing the aisles of this art and cultural event are expected to exceed six-figures. Mission Federal ArtWalk crisscrosses Ash and Grape Street between 11 a.m. to 6 p.m. on Saturday, April 27 – Sunday, April 28. Visit artwalksandiego.org for more details. Attendance is free. — Lucia Viti is a San Diego-based freelance writer. Reach her at luciaviti@roadrunner.com.